Studying abroad in Prague for the past three weeks has been a once in a lifetime opportunity. I loved studying migration, considering we were participating in a small migration ourselves. I met an amazing group of students to travel with. Without them, this trip would not have been half as wonderful as it was. My favorite moments were spending time at Prague Castle, and climbing to the top of Powder Tower. I was happy that the trip included an excursion to Terezín, where we visited a WWII concentration camp. 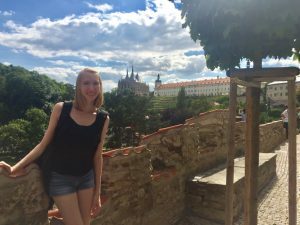 My advice to future students would be to spend the time and money on guided tours throughout Prague and the Czech Republic. I recommend going on a guided tour of Kutná Hora to visit Sedlec Ossuary and St. Barbara’s Church. That was the highlight of my trip. I am sad to leave the Czech Republic, but I know I will be back!! Also, Czech beer is as good as they say it is.